The opening keynote speaker was Evelyn Nakano Glenn, UC Berkeley Professor of Gender & Women’s Studies and of Ethnic Studies. Professor Glenn was elected President of the American Sociological Association (ASA) in June 2008. She called the symposium “professional and stimulating.” In her opening, Professor Glenn provided a fascinating introduction into her research regarding the phenomenon of colorism. The presentation was a brief preview of her most recent work, Shades of Difference: Why Skin Color Matters (2009). Michael Burawoy, UC Berkeley Sociology professor and 2004 ASA President, also attended and praised the event as “unlike any the campus has ever seen.” The event received immense support from the UC Berkeley Department of Sociology and many other programs and organizations on campus. 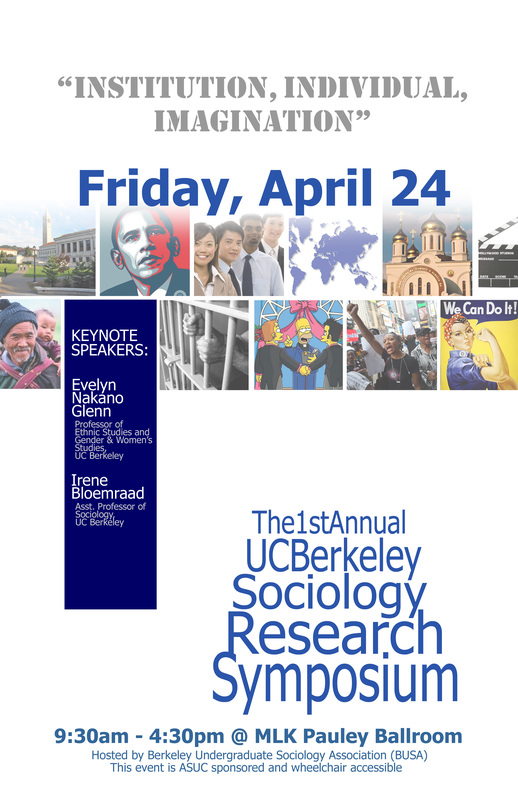 Throughout the day, undergraduate and graduate students from more than 20 departments on the Berkeley campus presented sociological research in themed sessions. In between sessions, a delicious lunch including Japanese, Mediterranean, and Thai food was provided accompanied by a performance of the UC Jazz Ensembles. The Symposium closed with a thought-provoking presentation by Irene Bloemraad, a UC Berkeley Associate Professor of Sociology and Scholar at the Canadian Institute for Advanced Research.